There’s a lot of activity that takes place in our kitchen. In fact, as in most homes, our kitchen is the busiest room in the house. As a lifelong home cook and cookbook author, I’ve spent countless hours sautéing, stirring, mixing, and baking. So much so that it’s a welcome change when we travel and let someone else do the prep work, cooking, and clean up. It is, however, always nice to return home and eat our own meals where I know how they’re prepared and can carefully choose the ingredients. While we enjoy eating out immensely, we also enjoy our own home cooking. With all of the cooking that has taken place in our home over the years, we have purchased many types of well-known cookware brands. After putting in a professional kitchen about 10 years ago, we bought even more equipment because of the high BTUs on our gas range. Certain types of cookware are more suited to and work better when you can achieve really high temperatures with a gas stovetop. Because of our experience with various types of cookware, I was excited when asked to review the new line of Wolf Gourmet cookware. It wasn’t that I needed another set of pots and pans. After extensive cooking for many years, we have plenty of cookware, which include our favorite go-to pieces (and unfortunately those that we store and never use). Rather, it was because I have respected the Wolf name in appliances for many years and know they make great products. I also wondered how this line might be different from all the other cookware available on the market. What makes some cookware better than others? This is a question that will probably get a lot of different answers, depending on who is doing the cooking. For us, it’s all about even heating, pieces that are comfortable to work with, pans that don’t stick and will release the foods, and ease in clean up. For certain types of cooking, many of our pans have a steam vent, so that while the pans are sealed with a tight fitting lid, they still release some moisture through the vent. This is ideal for cooking things that tend to boil over (like soups or rice). It also helps avoid the rattling noise that can occur when boiling liquids. Then there are times when you really want to seal in all of the moisture and not let any of the liquid escape (such as when braising meats or making stews). We also like to have a few pieces of nonstick cookware for cooking eggs or delicate ingredients such as a flaky thin fish (think Dover or Lemon Sole). We don’t like to use nonstick pans frequently because of the health concerns over the wear and crazing of the coating and cooking with high temperatures, but they are important for cooking specific foods. That’s why it’s nice to have a selection of various pots, saucepans, skillets, and Dutch ovens, all with various types of lids. After using several of the Wolf Gourmet pieces in the set for various recipes and basic cooking, we found that this line of cookware is unique in performance. The 7-ply design (with an aluminum core) heats up very quickly and evenly (even faster than cast iron or enamel coated cast iron pieces and they heat as evenly). They also require less BTUs to achieve the preferred cooking temperature in the pan, so I found myself turning down the flame during the cooking process, especially once the pan had come up to the desired temperature. Their style is ergonomic in design, so it’s comfortable to work with and the pans have flared rims which prevent spilling when pouring liquids. Wolf Gourmet cookware is also beveled in design to prevent burning and sticking. They recommend preheating the pans with a little cooking oil prior to adding proteins, so I decided to try this with eggs prepared over easy. After brushing the skillet with a very thin coating of Canola oil (and then removing all but a film of oil with a paper towel), I then added a small pat of butter and melted it, followed by the egg. Much to our surprise, the egg didn’t stick when I went to flip it over. 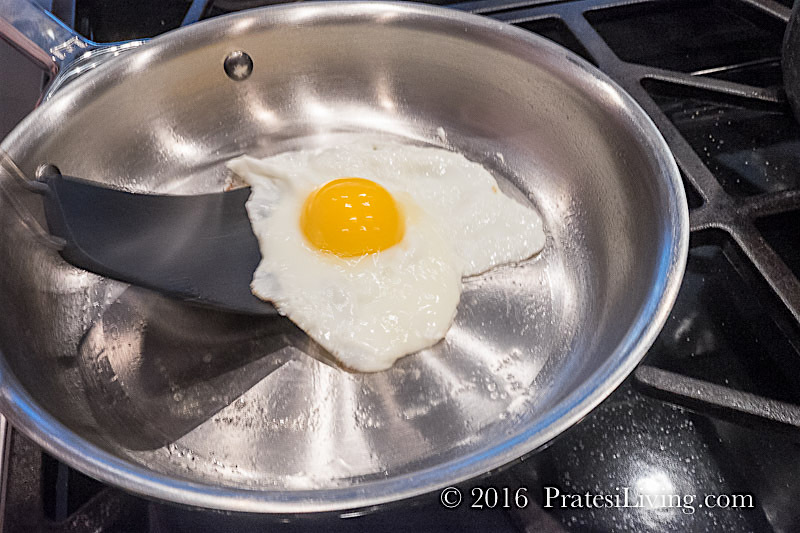 There are very few pans we own that will cook an egg with minimal fat in the pan without the egg sticking. We were impressed. 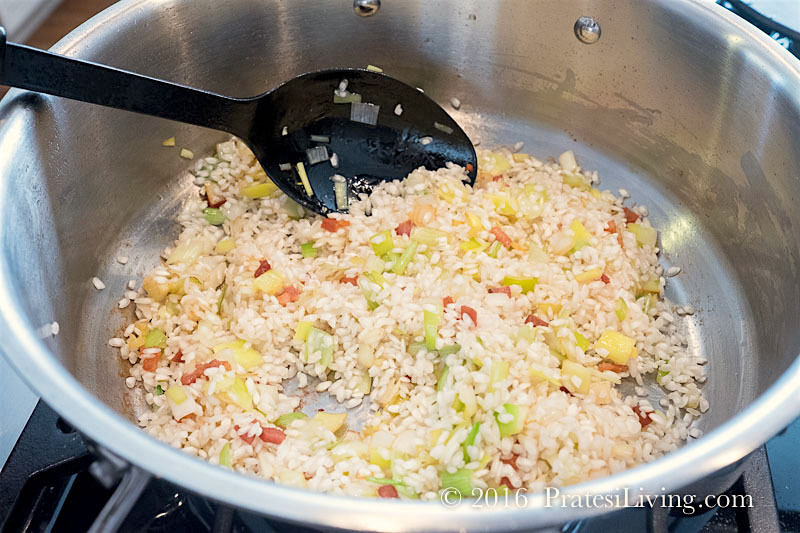 I then decided to prepare a tricky dish that can stick to the pan or scorch easily, risotto. 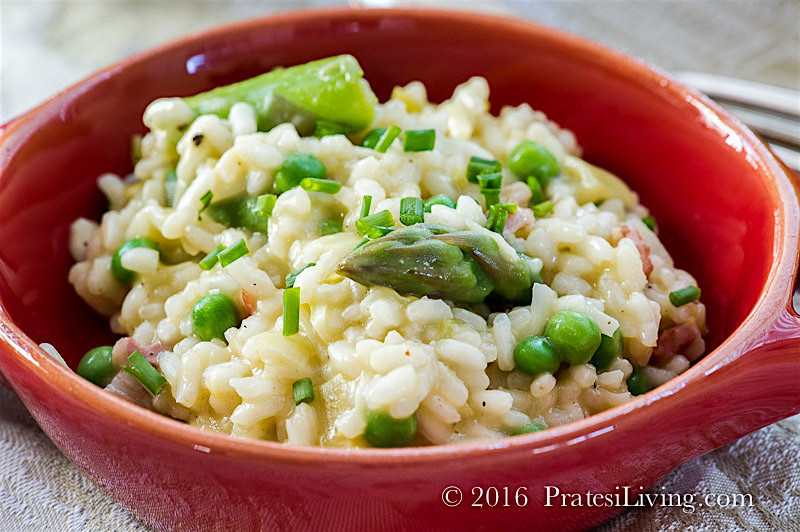 I had been craving a Spring Risotto with all the fresh asparagus available in the stores. I couldn’t find fresh peas, so I had to substitute frozen, but hopefully, they will be available now that it’s April. It was the perfect dish to try since it requires even heating, has several steps (sautéing, boiling and reducing liquids), and a longer cooking time. The 3-quart saucepan was used to bring the chicken stock to a boil and then kept over a low simmer. I then chose the Dutch oven to prepare the risotto. As we had discovered with the other recipes and times we used the cookware, I needed to keep the flame lower to achieve the desired temperature and not cook the ingredients too quickly. The pan performed really well and none of the rice scorched or stuck to the bottom. The finished risotto was perfectly creamy and rich and best of all, the Dutch oven cleaned up quickly and easily with no stuck-on food or residue. The other feature that we really like about these pans is that the handles stay cool, so you can move them around the stove without having to use potholders. These pans can go in the oven (up to 500 degrees Fahrenheit), so the handles heat up then, but it’s nice that you can work with the handles while cooking on the range top. As I mentioned above, some pans seal in the moisture and some don’t. The lids on the Wolf Gourmet cookware do seal tightly and do not have vents. If you need to vent the pans during cooking, a simple option is to leave the lids slightly ajar to let the steam escape. Our favorite pans depend on what we are cooking and the cooking method. We often use copper for sautéing. 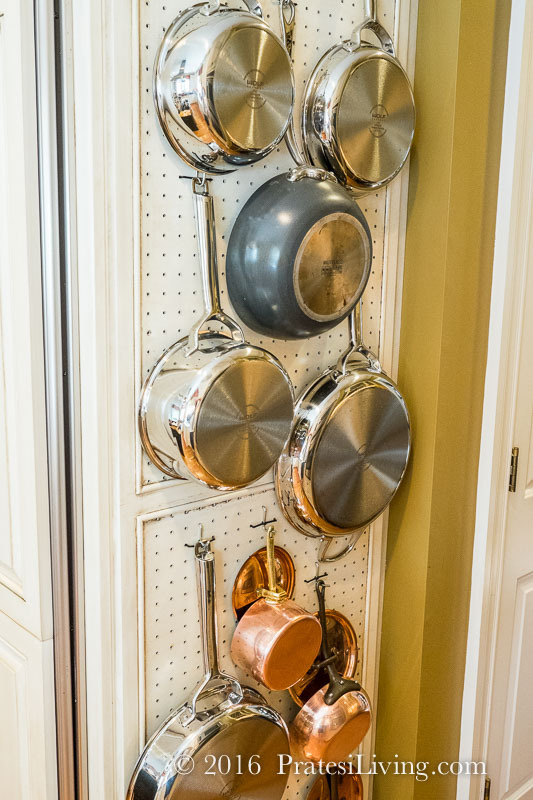 The pans heat quickly and evenly and the pieces look beautiful on the kitchen pegboard, when polished. For braising, we generally prefer the enamel-coated cast iron brands. They heat up quickly and evenly, retain the heat, foods don’t stick (when cooked at the proper temperatures), go from stovetop to the oven, and clean up easily. The Wolf Gourmet pieces are very similar in that they have many of the same features of both, but with an added bonus, they don’t weigh nearly as much as cast iron and they don’t need polishing. So, they are a great option if you are concerned about lifting heavy pans on and off the stove and in and out of the oven and don’t want to polish your cookware. If you like to cook, you know that fresh and excellent ingredients are the key to creating great dishes. So is the cookware you choose to use. We have now replaced some of our favorite older go-to pieces on our pegboard in the kitchen with the new Wolf Gourmet pans and skillets, so I guess we’ve found our new favorites to use in the kitchen. 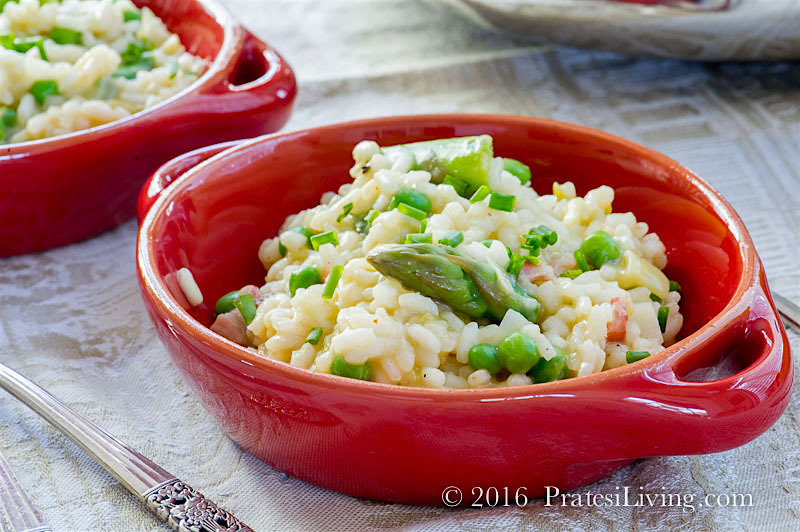 With the official arrival of spring last month, this risotto is the perfect way to celebrate. Asparagus season is in full swing and hopefully, fresh English peas are now available at local Farmers’ Markets and specialty grocers. I know some people are afraid to try their hand at making risotto, but it really is easy to prepare. All of the ingredients are prepped ahead of time and all it requires is about 30 minutes of your undivided attention at the stove. Adding the stock at the right times and the constant stirring of the rice will make for a creamy and delectable dish. There’s no need to order risotto while dining out when you can make an excellent and fresh version at home. While risotto seems quite rich, it’s the chicken stock combined with the starch from the Arborio rice that creates the luscious sauce that coats every grain of the rice. In this version, I add a little pancetta to give the dish another layer of flavor and richness. I’ve also used leeks (rather than onions) to incorporate a bit of sweetness and fresh lemon zest for brightness. Congratulations to Marie on winning a piece of the Wolf Gourmet cookware! 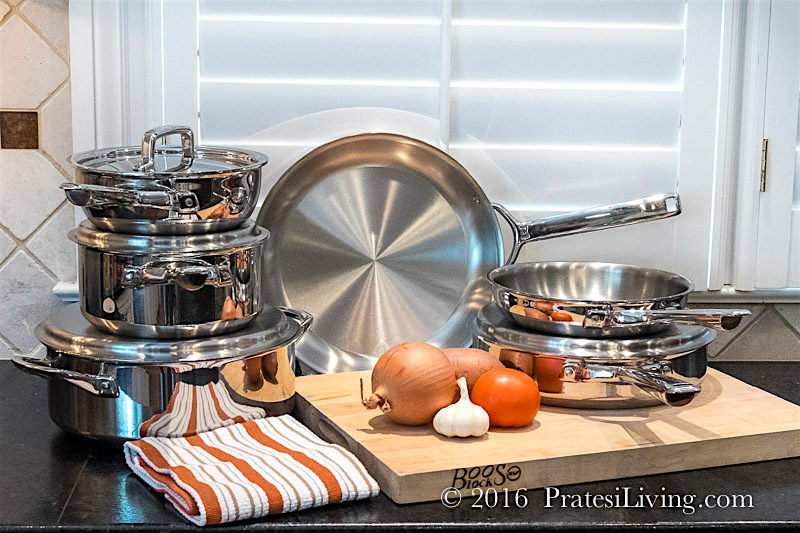 If you are a regular subscriber to PratesiLiving.com, you can enter the giveaway by leaving a comment below telling us which piece of cookware from the set you’d like to win. Premium Members are automatically enrolled in the giveaway. Or, you can subscribe to regular updates from PratesiLiving.com and then leave a comment as directed in 1. above. If you’d like to become a Premium Member, you can do so until April 16, 2016, by enrolling at this link and use the code “WOLF.” You will then be automatically enrolled in the giveaway. Note – Only regular subscribers and Premium Members are eligible to win the Wolf Gourmet Cookware Giveaway. You must also be a resident of the Continental U.S. to win as the cookware cannot be shipped internationally. The giveaway ends at 5 pm EST on April 18, 2016. 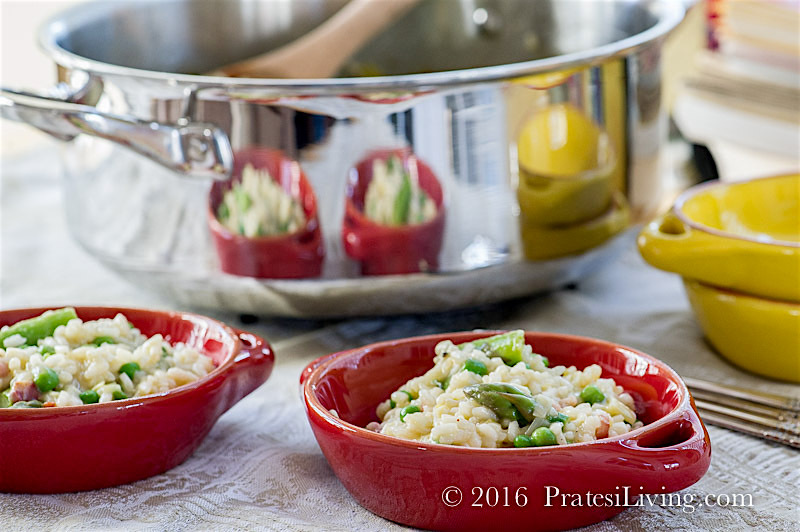 The simple to prepare risotto is the perfect way to welcome spring. Use the season’s local asparagus and fresh English peas, if possible. The amount of seasonings required (salt and pepper) will depend on the chicken stock you choose to use. If it’s homemade or lower in sodium, you may need to add more of both, to taste. The recipe will serve 3 to 4 generously as a main dish and will serve 6 as a side dish. Heat olive oil in a medium Dutch oven (or risotto pan) over medium heat until hot, but not smoking. Add the pancetta, stir, and cook, reducing heat slightly, until pancetta begins to brown and render some fat. 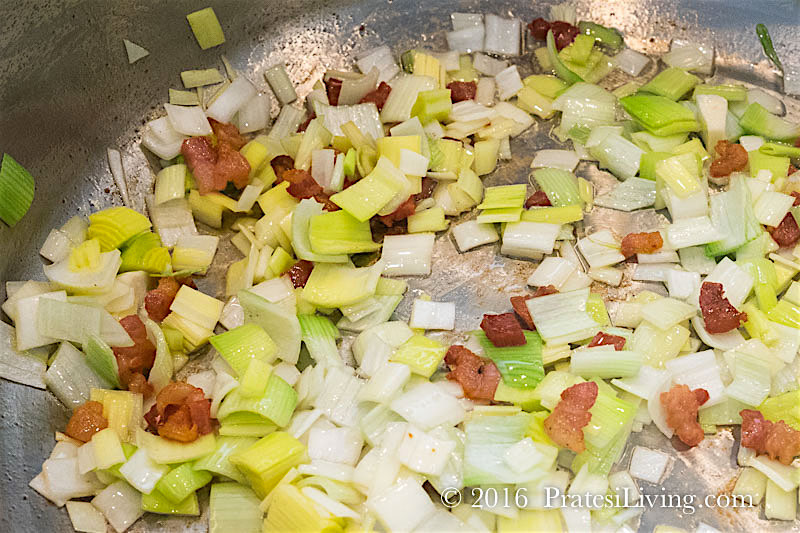 Add leeks and sauté for about 3 to 4 minutes, just until they begin to appear translucent. 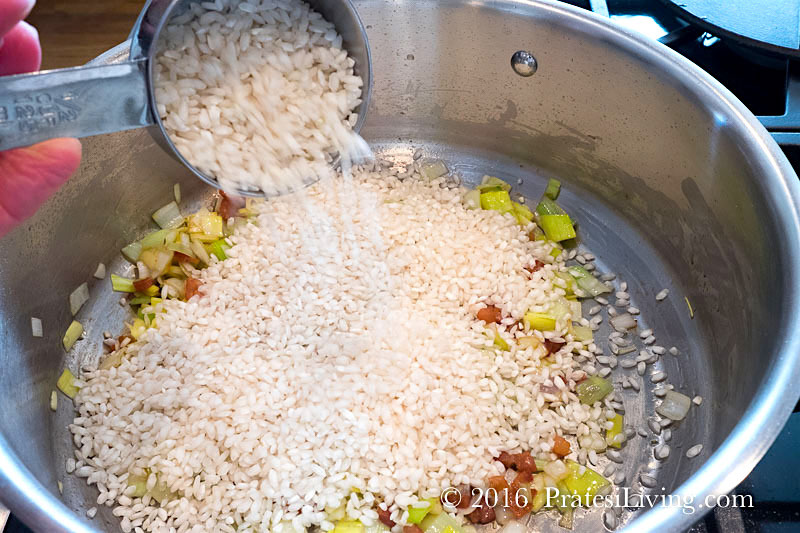 Add the rice and stir for a minute to coat the grains with the pancetta, oil, and leeks. Then add the white wine and simmer over low heat, stirring constantly, until most of the wine has been absorbed. Begin to add the chicken stock, a little at a time (about 2 soup ladles each addition) and stir almost constantly until each addition of stock is absorbed before adding more, adjusting heat as necessary. 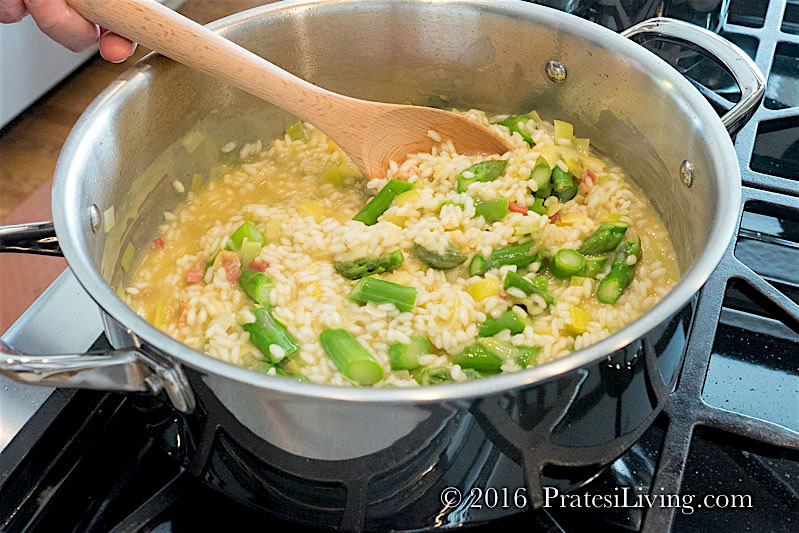 After risotto has been cooking about 20 minutes, add in the blanched and drained asparagus pieces and 2 ladles of additional chicken stock. 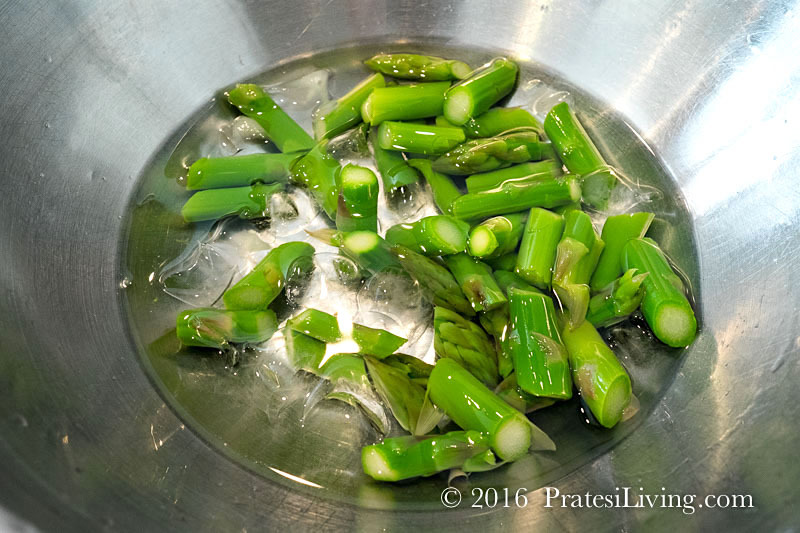 Stir and cook until asparagus is warmed through and stock is absorbed. Then add in the frozen (or fresh peas), Parmesan cheese, salt and pepper to taste, and additional stock, as needed. 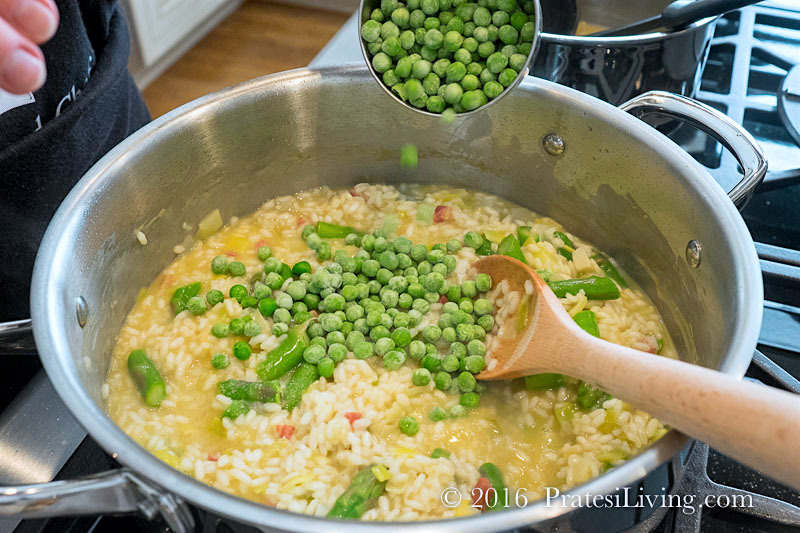 Cook until peas are cooked through and rice is tender, but still firm and risotto is creamy. 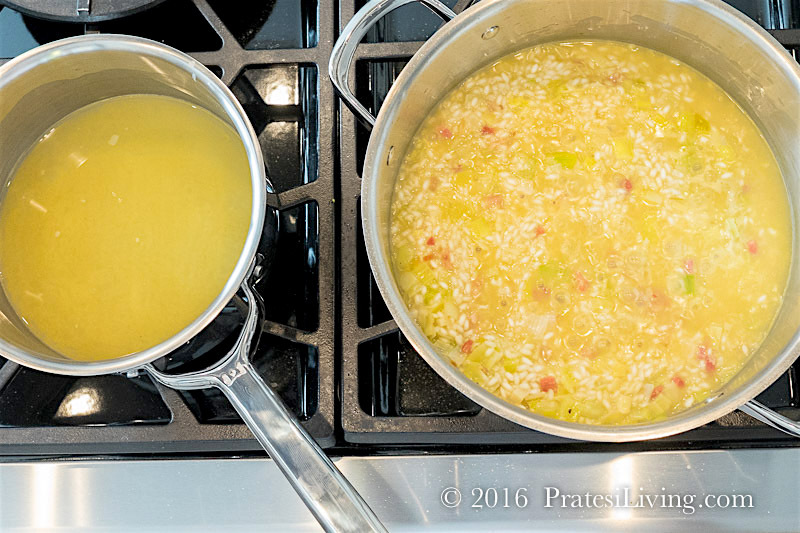 The total process of adding the stock and cooking the risotto should take about 30 minutes. Finish with lemon zest and taste again for seasonings. Serve hot in individual serving bowls garnished with chopped chives and additional grated Parmesan cheese, if desired. Disclosure – Wolf Gourmet provided a set of their cookware for our review. We have not been compensated for this article and the opinions expressed regarding our experience using this line are our own. I just subscribed and would love to win the 6-Quart Dutch Oven with Lid. I’ve never made risotto, but I do have some arborio rice in the pantry. I love the way your recipe looks and the ingredients sound wonderful – I’m a big fan of leeks! I’ll definitely be trying this recipe even if I won’t win. Would love to win the 6-Quart Dutch Oven with Lid! It would be such an awesome addition to my kitchen. I currently use an old enamel dutch oven that more often than not, burns anything that I try to cook in it! I don’t deserve to win a thing….But, I want to say, “Your article is beautifully written, informative, and the photography is knock out-top level. These pans look amazing! I would love to win the 3 quart saucepan with lid. And tomorrow, I am making this recipe. Delicious, thanks. I would love to win the 6-Quart Dutch Oven with Lid; that size is capable of handling so many dishes. Your recipe sounds super good! These pans look amazing! I am picturing them all in my kitchen. Swoon. If I have to pick just one, it would be the 6-Quart Dutch Oven with Lid. 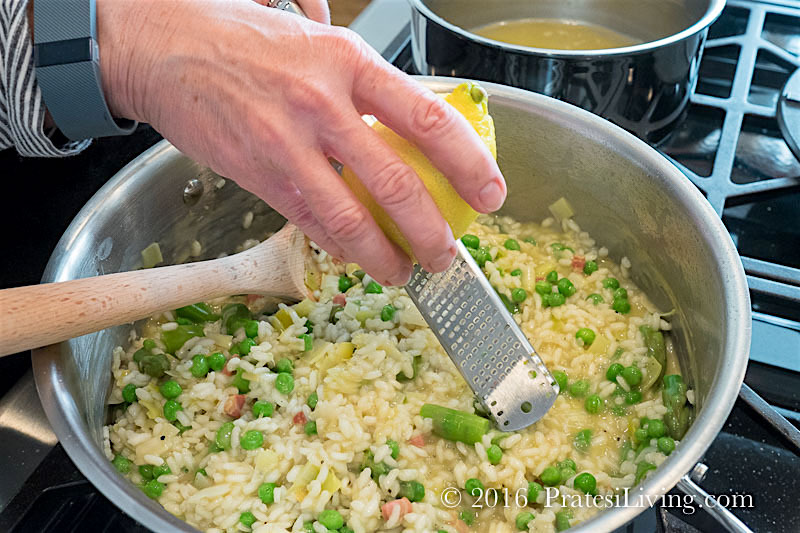 Off to make Spring Risotto for dinner. I always struggle with 3.5-Quart Sauté Pan with Lid. They ruin so fast. I am impressed with the wolf gourmet egg fry. will have to download and try the risotto to welcome spring. I would love to win the 6 quart Dutch oven with the lid. I enjoy your articles, adventures and of course the pictures. Love to try the 11.5 skillet. I have always lusted over Wolf Gourmet cookware. So many beautiful pieces! Also, that risotto looks delicious. Funny, because I have never tried making risotto.. I must pin this! I would choose the 3.5 Quart Sauté Pan with Lid! I am subscribed to both mailing lists.. I am a premium subbie! Yay! Always can use another dutch oven! Useful for so many applications. Lovely cookware, have always been a fan of Wolfgang’s Products. Thanks for hosting such an awesome giveaway! I think that 11.5″ skillet is calling my name!! Your risotto looks so fresh and yummy- I love it! I would love the 6 quart Dutch Oven. I’d love to win the 6-Quart Dutch Oven with Lid. I could always use another dutch oven!